In this article, we picked five parks that we will be traversing with Deux Pas Vers L’Autre within the first five countries of our thru-hike. Here they are below, in the order of the itinerary. Europe has always been a hiking sanctuary. How many trails and possibilities? There is good things and downsides walking into Natural Parks. Of course you can feel sometimes a little overcharged of rules, no camp fire, no swimming no no no…. But natural parks are sanctuaries, sanctuaries for the respectful hikers thursty of what Earth has the most beautiful to offer us. Through our European adventure, we will be traversing more than 120 natural parks and reserves in 17 countries. Check the full map on our website and discover the itineraries you will be soon able to vote for! If you decide to hike in Portugal, one of the most natural parks to aim at is the South West Alentejo and Vicentine Coast Natural Park. The landscape is magnificent thanks to the stunning cliffs along the coast. Zoologists and botanists from all over the world come to the park to study the unique natural richness. It is home for a few birds species than can only be found there. The Rota Vicentina is a fantastic network of trails totaling more than 450km along the well-preserved coast line. The two main routes are the historic trail and the fisherman’s trail. Thru-hiking the Rota Vicentina Historic trail should take you about 10 to 12 days. It has been named one of the leading trails by by the ERA European Ramblers association for its absolute respect of nature. The coastal path (alias: fisherman’s trail) is shorter than the other trail even if more demanding. Its amazing scenery is something to see absolutely! Portugal will be the start of our journey but also a country we really wanted to take the time to discover out of the busy months. The weather is not too cold in February but facing the strong humid wind on the cliffs for weeks is something that remains a challenge. Much more than just a desert, the Bardenas Reales are the jewel of an entire region. On arrival in the Bardenas desert, you will surely feel that you’ve arrived on Mars. The diversity of landscapes is surprising; the hills and the chimneys give the site an air of “monument valley,” and the deep, sinuous ravines trace crazy forms in the landscape. True mysteries of nature are revealed through an unexpected variety of flora and fauna. The Bardenas Reales are the second largest European desert after that of Tabernas located in Andalusia. The desert has a surface of 42,000 hectares. Also, the Ecosystems are numerous, varied, original and exotic; a paradox for a desert. This natural park of wild beauty, declared a Biosphere Reserve by UNESCO, stands in stark contrast to the landscapes we usually see in northern Spain. The mountains of the Pyrenees, so close, have been gradually erased to make way for vast arid and inhospitable lands. While many deserts are synonymous with austerity, here this is not the case; the change of scenery is guaranteed, the permanent astonishment, the inevitable curiosity. Hiking in France is something a little special for us, as you can imagine! France is our home, and it is also where we faced our first serious trails. France has the greatest marked trail networks of the world to our knowledge. It is a pleasure to walk there and the best place to keep the GPS in your bag. The Mercantour National Park (French: Parc National du Mercantour); is one of the ten national Natural Parks of France and it is also an amazing place here to hike. The Mercantour Park is famous for being a sanctuary for many species—it’s one of the rare places you can meet a wolf. Located in the territory of the departments Alpes-Maritimes and Alpes-de-Haute-Provence, the Park has three flagship sites. The Valley of Wonders and its prehistoric engravings, the Allos Lake: at 2,200m it is the highest elevaton lake in Europe and the Boréon. You can see pictures of this in our pre-trip 1. In the past, The Mercantour National Park was hunting reserve for the kings of Italy. Indeed, until 1861, this slope of the Alps was Italian. The Mercantour is often crowded at the peak of the season and best is to avoid those moments to truly enjoy the wilderness of the park. 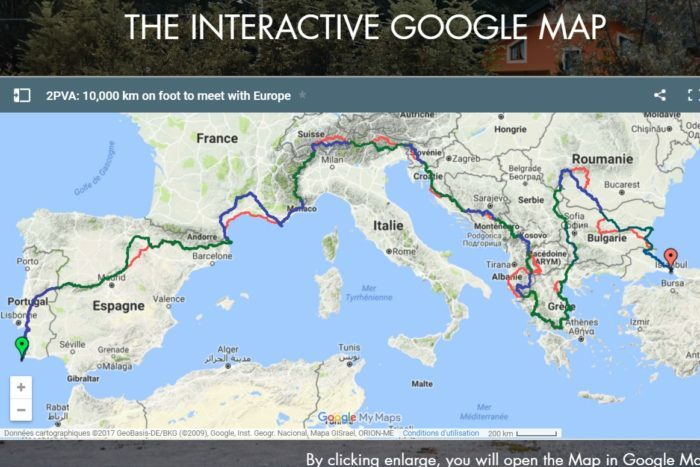 Many long distance paths cross through over Mercantour, check MON GR for details, they have a great map of the major trails they are now working on! Yes we love walking in italy!! Italy is a fantastic Hiking location ! Landscapes in this country are fantastic and so diverse! The natural Park of the High Valley Antrona is a stunning alpine location for your upcoming summer hiking trips. Located in the province of Verbano Cusio Ossola, the park covers a surface of nearly 7500 hectares with a total elevation gain of more than 3100m from the lowest to the highest point. The park is located at the Swiss border. Its highest peak, the Pizzo Andola , culminates at 3665m The park has 18 lakes at altitude higher than 2,000m and is absolutely stunning. The Park is on the Blue Trail of the Via Alpina. It is one of the most demanding long distance paths of Europe. Check out their website to thru-hike the Via Alpina. Italy has a rich mountain culture. People are talkative and welcoming. During our pre trip 1 we were surprised of the generosity of the Italian mountaineers. I hope it was not a false impression as we will spend nearly 2 months walking there! At last! Here is marvelous place located in Switzerland with a true mountaineering soul ! With a total area of nearly 600 square kilometers, a third of the Park has never been touched by urbanism. The highest peak of the Park is the Piz Calderas, at 3394 meters. To place this Park on your own Thru Hike, you can check the Red trail of the Via alpina; it is longer and more demanding than the blue trail. We often consider this trail as the longest and hardest trail of the alps. Switzerland is a country of mountains. If in many countries mountains represents a little part of the territory, for Switzerland it is very different. There are always many villages and it is not the place to go if you want to feel isolated and alone in nature. Discover soon 12 other amazing locations to hike in Southern Europe that we put on our itinerary. Check out our website for more info on the itinerary, as well as the GPX files. As always, feel free to share your hiking experiences in those countries with us!